The Nazi occupation of France is almost at an end as DIPLOMACY begins. German General von Choltitz (Niels Arestrup) knows this. Surrender is not an option for reasons we will learn. Instead, von Cholitz is planning to carry out his final orders to destroy up as much of Paris as possible. The Louvre, Notre Dame Cathedral, The Eiffel Tower: all are set to blow. And along with these famous landmarks, more than a million Parisians will die. Strategically it will do little but stall the inevitable march of the allied forces. The main reason for the horrific destruction is that Hitler, who evidently loved and admired the city, just doesn't want anyone else to have it if he can't. It's obviously no spoiler to say that Von Cholitz refused to carry out his orders and Hitler's plan did not come to fruition. But how and why? 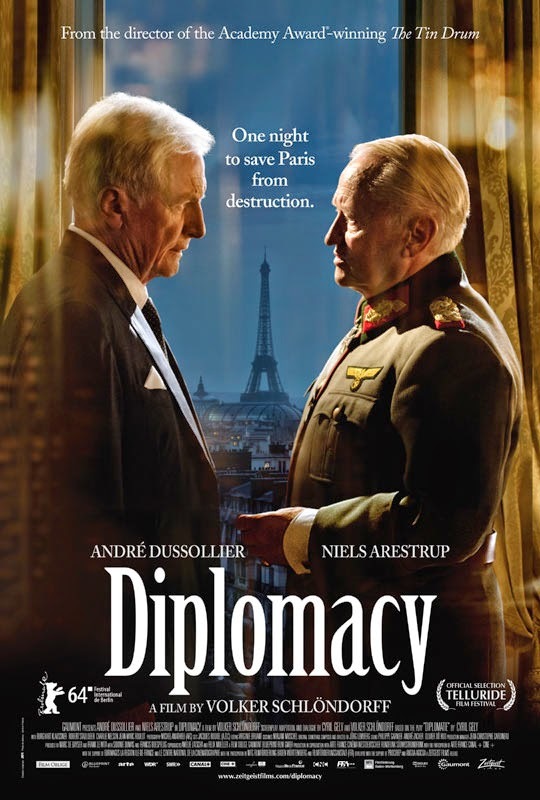 DIPLOMACY uses a fictional discussion between von Cholitz and Swedish ambassador Raoul Nordling (André Dussollier), who surreptitiously sneaks into the German commander's hotel room, to give one possible answer. There is no historical reason to believe this meeting actually happened, although Nordling was able to use his position to bargain with von Cholitz in other instances. Still, it seems a reasonable storytelling conceit to take what would otherwise have been an interior monologue and turn it into a conversation between two characters for dramatic purposes. DIPLOMACY had its origins as a stage play by Cyril Gely, and as such the writing and acting are at its core. Arestrup originated his role on stage, but there's nothing stagey about his performance. He allows us on occasion to feel a little bit of empathy for his German general, but also never lets us forget that this is a man who has repeatedly put his orders ahead of any reasonable notions of morality. Dussollier has the slightly more showy role as a character who uses his wits to probe for chinks in the General's psychic armor, knowing he has to find some way to connect with this man if he's going to save the city and its people. Director Volker Schlöndorff does his best to give the material a cinematic feel, venturing outside the General's hotel room when it makes sense, and bringing in a fair number of bit players to beef up the cast. The editing by Virginie Bruant helps, too, giving the film a sense of urgency that never crosses over into being overly busy. It may not be the sort of cinematic tour de force of Schlöndorff's best known film, the 1979 arthouse hit THE TIN DRUM, but it is a solid drama about a pivotal moment in world history that could have turned out very differently. 3 ½ out of 4 stars.